If you’re looking for holiday treats for your nut, egg and/or dairy allergic loved ones, check out Divvies. It’s a really cute mail-order bakery that creates safe and kid-friendly desserts that really do taste great. 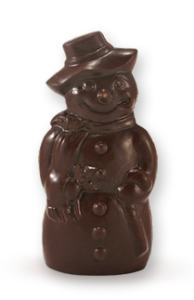 I’m particularly partial to the cute chocolate snowman ($8), a solid block of semi-sweet deliciousness.